Although New Jersey is among the most urbanized states, tourism ranks as its second or third leading industry. Tourism in New Jersey generates nearly $40 billion annually and supports about 300,000 jobs (about 10 percent of the state’s employment). It is a significant source of revenue for local and state governments. Nearly two-thirds (62 percent) of tourism revenues are from three coastal counties. As could be expected, the state and local governments are active promoters of tourism. Superstorm Sandy was the second-costliest hurricane in U.S. history. 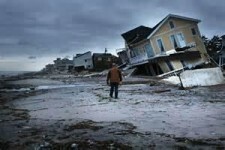 It hit New Jersey at the end of October 2012 causing 37 deaths and considerable damage. Although no part of the state remained unscathed, damage was concentrated along the shore with homes, businesses and boardwalks demolished. Beaches (some recently replenished) and a roller coaster were washed out to sea. Flooding damaged roads, power and boating infrastructure. Costs of estimated damage reached over $30 billion with 346 homes damaged or destroyed. Although the storm hit after the close of the 2012 tourist season, there was immediate concern about restoring the shore tourism infrastructure before the start of the 2013 season and allaying the concerns of tourists, many of whom book their summer vacation rentals in early spring. The state initiated a marketing campaign with the slogan “Stronger than the Storm” to bring tourists back to New Jersey. The campaign included billboards, radio, T.V commercials and social media. Funding came in part from the federal government when the U.S. Department of Housing and Urban Development (HUD) granted a waiver, which allowed New Jersey to use $25 million of HUD funding to promote tourism in the State. The New Jersey Economic Development Authority administered the campaign and was one of the responsible bodies for disbursing Sandy relief funding. Controversy quickly arose after the advertising firm of MWW, based in East Rutherford, was awarded the marketing contract for $4.7 million in competition with three other firms, one of which bid $2.2 million less. The campaign’s official start in May coincided with a broadcast of the Today Show live from Seaside Heights co-hosted by Governor Chris Christie and featuring the Lieutenant Governor Kim Guadagno at a ribbon cutting. The Governor—who may or may not run for President under the Republican ticket—also appeared with his family in the campaign’s TV advertisements. The campaign occurred in the midst of a gubernatorial election, and many thought that it provided unfair exposure for the Governor during his re-election bid. U.S. Rep. Frank Pallone asked the inspector general of HUD to investigate the use of HUD funds for the campaign starring the Governor. Although an audit was ordered, the report has not yet been published. The state tourism marketing campaign continued in 2014, again partly financed by federal funding, but with a new tag line of “New Jersey Going Strong” replacing “stronger than the storm” and not featuring the Governor. Whether the consequence of the marketing campaigns, nostalgia for the beach or other reasons, the 2013 tourism season saw a 1.3 percent increase in visitor spending over the previous year despite a cool, wet June and a reduction in the summer rental housing stock. The 2014 season, currently underway, shows signs of continued improvement. Of course, the private sector provides considerable marketing to tourists from within and beyond the state, while most New Jersey counties (and some of the 565 municipalities in the state) also have tourism marketing programs. The state has enjoyed several recent boosts to tourism, such as the return, in September 2013, of the Miss America pageant to Atlantic City after six years in Las Vegas. However, enticing the pageant to return required a package of incentives which included $7 million in state and county money to help pay production costs over three years. Super Bowl XLVIII, played in the Meadowlands Sports Complex on February 2, 1014 also turned the “eyes of the world” (or at least the U.S.) on New Jersey as it was the most watched television program in U.S. history. However, costs to the state included $7.5 million to the Sports and Exhibition Authority to cover sales tax it reimbursed to the National Football League (which is tax exempt). NJ Transit spent $7.2 million on the event but generated only $1.6 million in revenue. With 4,000 police and security officers, security costs ran in the millions of dollars. Meanwhile, much of the tourist revenue went to New York State where between two-thirds to three-quarters of hotel rooms and much of the festivities associated with the event were held. In summary, New Jersey’s state and local governments are active in promoting the state for tourism, but a rigorous cost/benefit analysis on these expenditures has yet to be conducted, and may not be possible given the nebulous cause-and-effect relationship between marketing and tourist spending. While it can be argued that New Jersey’s tourism industry benefited from the public investment in marketing, whether the use of scarce federal and state monies could have been used more wisely and effectively for recovery is an open question.